3 : theatrical entertainment of a broadly humorous often earthy character consisting of short turns, comic skits, and sometimes striptease acts. Why have I decided to call it Burlesque: it's all about the colours. Fuchsia (not pink, not rose, but Fuchsia) and black. Pitch black. Lingerie colours - but not the good-girl kind! I imagine it would go well with a long pink boa and black fishnet tights. 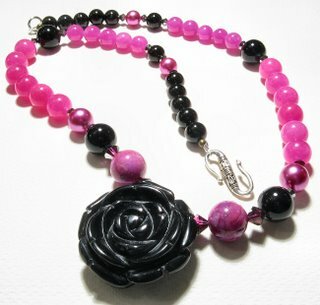 But hey, it's only a necklace! For the well-mannered ladies that would like perhaps to misbehave a bit. Once in a while. 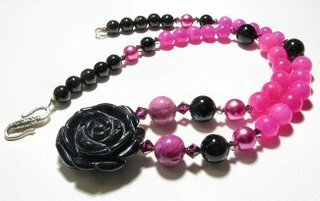 - Black metal spacers in the back of the rose to cover the wire. 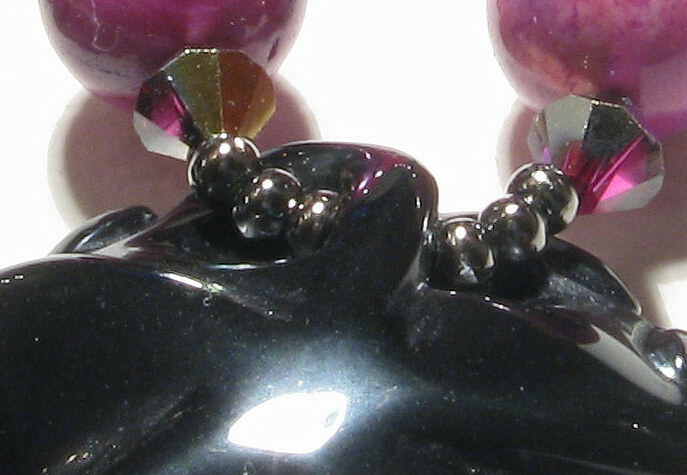 On the 1st picture a detail of the back of the necklace, smooth black obsidian. On the 2nd one we can see the black metal spacers covering the wire and the lovely Swarovski fuchsia bicones that I used as accent beads. 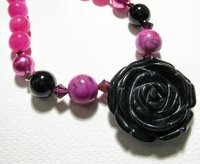 A close-up of the rose. If you click on it you will see it magnified. 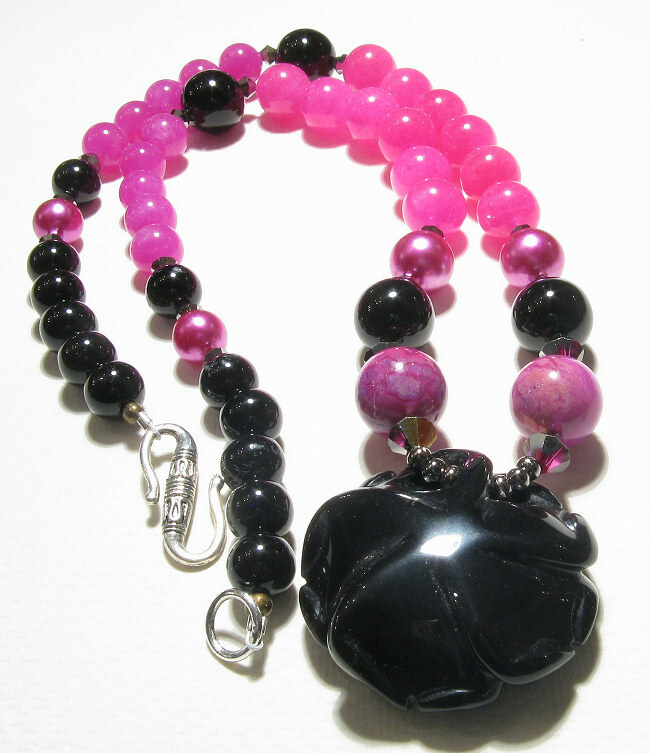 You can also see the Crazy Lace agate beads, the large onyx beads and those Japanese pearls. In spite of their age, they are still very smooth and shiny. 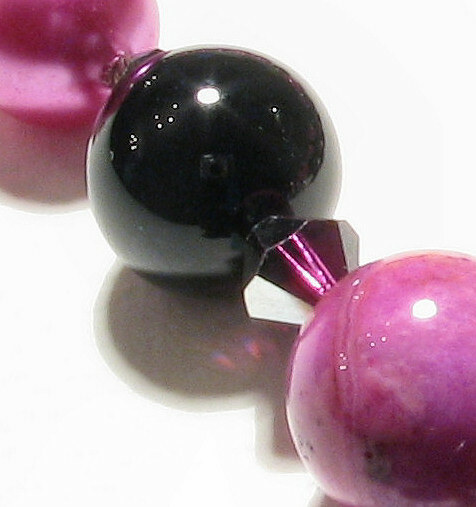 Some of the fuchsia jade beads are also visible here. 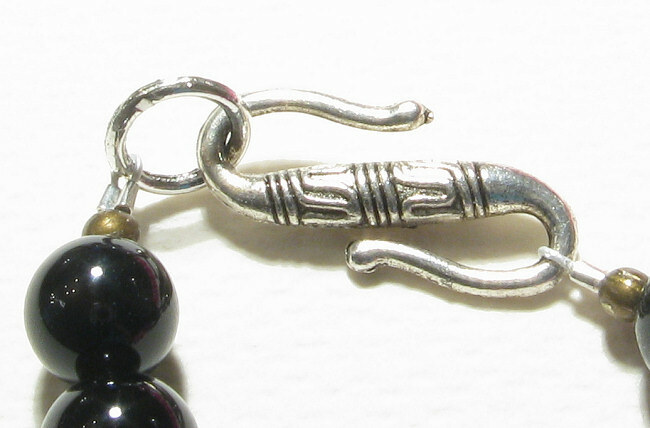 The clasp is the usual S-hook in Tibetan silver. 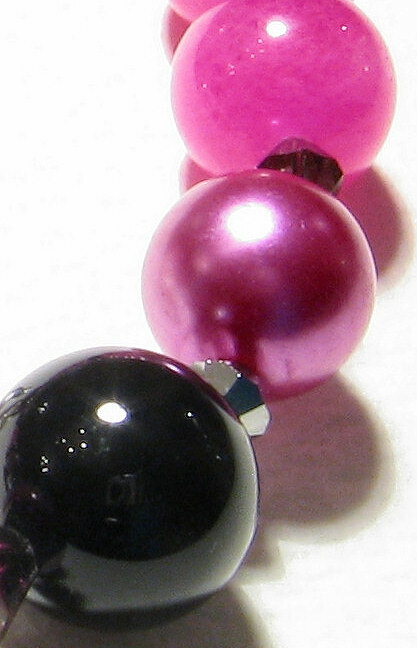 On the 1st picture, detail of one of the black onyx beads and Swarovski bicone and, on the 2nd one, a close-up of the Japanese glass pearl and fuchsia jade. I recycled these pearls from a very old necklace that I won in an auction. 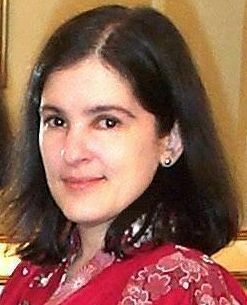 The necklace itself (clasp and thread) was falling to bits, but all the beads were intact and pretty much like new.